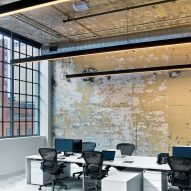 Nearly a century of layered paint creates texture on walls throughout these offices for an advertising agency in North Carolina, which TPG Architecture created inside a former factory. 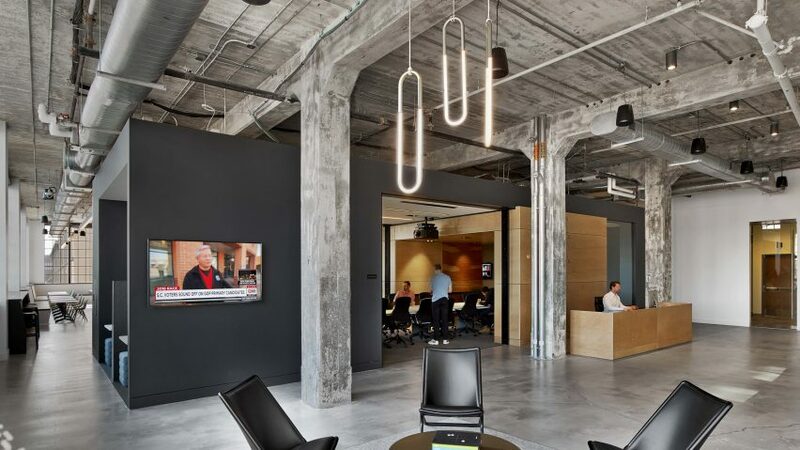 After completing work on the Boston headquarters for MullenLowe, TPG was asked back to design the company's new offices in Winston-Salem. "The office design was an opportunity to create a strong communications touchpoint expressing MullenLowe's identity as a 'challenger' in the advertising industry, a scrappy do-everything ad firm with a global reach," said the firm, which is based in New York. 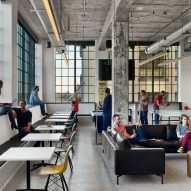 The 37,500-square-foot (3,484-square-metre) space is located in a landmarked 1930s tobacco factory, which sits within in the city's newly developed Wake Forest Innovation Quarter. 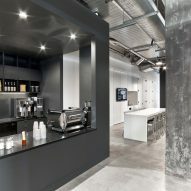 A large, deep floorplate, 14-foot-high (4.3-metre) ceilings and metal-frame windows form the bones of the building, which TPG aimed to "respect and celebrate". The team left the walls and ceiling untouched, inserting freestanding boxes and partitions between the columns to subdivide the space. Reception was placed at the junction of the two wings created by the L-shaped plan, which are split up into "functional neighbourhoods" that cater for a variety of employee needs. 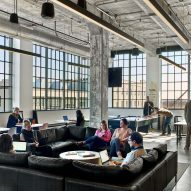 The assortment of collaborative spaces include conference rooms, smaller meeting booths, photo and recording studios, and a screening room with bleacher-style seating. TPG used the raw space to inform the material palette for the rest of the project. Layers of paint on the concrete structural elements, amassed during the building's history, were lightly sandblasted to prevent further peeling. The choice of chair colours was also based on the various paint hues, while the boxes were clad in plywood and dark-grey-painted sheetrock. The designers also devised a system of perforated metal screens, creating magnetic pin-up boards for employees. "The open work environment and common areas allow for more accidental collisions and natural collaborations, all of which are selling points when hiring new talent and pitching clients," TPG said. 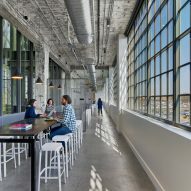 As manufacturing moved away from areas of the US, many industrial spaces were left derelict – but are gradually being revitalised through adaptive-reuse projects. 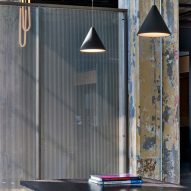 Examples include a factory-turned-art gallery in Manhattan, a warehouse converted into a creative workspace, restaurant and design store in Brooklyn, and an old paint factory transformed into an incubator space at the University of Pennsylvania.